Developed by Keen Games. Published by Deep Silver. Released August 5, 2014. Available on PC (reviewed), PS3, Xbox 360. Despite it not being a particularly outstanding series of games, I have a lot of love for those titles falling under the Sacred umbrella. Mechanically standard, narratively odd little games, there's nonetheless a fun energy and a sense of camp humor that makes the series thoroughly appealing. Sacred 2 was a particular favorite of mine, a vast hack n' slash RPG that was engrossing and shamelessly stupid in equal measure. 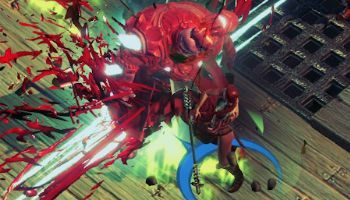 Unfortunately, Sacred 3 is a different beast from its predecessor, appearing to be more of a missing link between it and the beat 'em up spinoff Sacred Citadel. The open environments are replaced with stages selected on a world map, the traditional dungeon crawling action has a distinct brawler vibe to it, and the idea of sprawling character progression and loot has been replaced with a streamlined and linear leveling system. The result is a game that's still quite enjoyable to play, but far more repetitive, restrictive, and ultimately exhausting. Propelled with a strict commitment to "wacky" humor, the ludicrous story revolves around Ancaria's last heroes banding together to fight the evil Zane and his hammy collection of scene-chewing henchmen. Played by voice actors who have absolutely no fear, the over-the-top performances make decidedly lame jokes somewhat amusing, and while the story itself is fairly uninteresting, it's pulled off with enough enthusiasm to keep one at least tangentially invested. A hack and slash action game with more in common than Castle Crashers or Gauntlet than familiar Sacred games, this third main installment in the series will likely disappoint fans who wanted a return to The Old Ways. The point-and-click combat that put Sacred in the same box as Diablo is nowhere to be seen, and it's quite clear that this chapter is more at home on console controllers than mouse and keyboard. Each of the four playable characters get a melee attack, a shield-breaking bash attack, and two powerful special attacks selected between levels. Using a special attack drains energy, which can be replenished from random drops and is very quickly regenerated, while bashing is an essential way of exploiting weak points, interrupting enemy assaults, and disarming traps. Dodging around the map and learning when to bash enemies to make them prone for instant-kill executions helps make the game feel a little more tactical, but ultimately Sacred 3 is as button-mashy as they come, relying mostly on mindlessly hacking at dogpile after dogpile of monsters. There's nothing wrong with that, but the limited selection of characters and abilities, not to mention the rather formulaic maps and enemies, makes for a game that gets incredibly tiring after too long. After a while, each stage bleeds into the next one and one feels like they're going through the motions. Even the boss encounters at the end of each stage, large and impressive as they are, become a case of sussing out a fairly obvious pattern and then repeating a limited process until all the things are dead. It doesn't help that so many opponents and obstacles behave in identical ways. If you've seen one area-of-effect attack, you've seen them all. Once you've broken the shield of one heavily armored enemy, the others won't be much different. The same "avoid shadows of falling boulder" trick is played to a nauseating degree. Once this game does something once, you can expect to see it dozens of times, and chances are you'll have seen it done in dozens of other games. Characters get to level up their special attacks, as well as weapons and armor, but all the leveling is predetermined with no real room for customization. Weapons and attacks have the odd branching path on their skill trees, but only a mere handful, and none of them really impact gameplay to a remarkable degree. You never pick up new gear in the field, with a tiny arsenal instead drip-fed to you when the game decides, and there's only one piece of armor per character, similarly improved at a fixed rate.